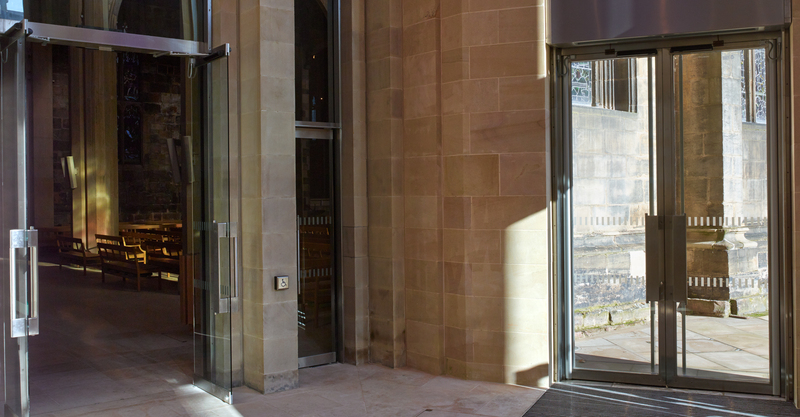 The stunning new entrance to Sheffield Cathedral in the heart of the Steel City owes much to the metalworking craftsmanship of fabricators at Arkoni Metalwork in Brighouse. The cathedral has recently undergone a major 61 week long refurbishment delivered by restoration specialists William Anelay Ltd, to the designs of London-based architects Thomas Ford & Partners, with the new main entrance constituting a central part of the works. Arkoni’s contribution to the project involved a £222,000 subcontract for the fabrication and installation of a series of stainless steel fins which formed a key part of the new entrance façade, the 11 large-scale thermally broken stainless steel satin polished window and door sets which enclosed the new entrance and shop. In addition, the 23-year-old Brighouse firm manufactured bespoke handles for the main entrance doors. These form a visual continuation of the fins and were an important element of the architectural design. Arkoni Director Martin Quarmby commented: “The door handles and fins are a work of art in themselves and called upon the experience and expertise of our fabrication team. The fins and door sets were installed using a cherry picker over the first four months of 2014 and the end result is a gleaming new façade that will stand the test of time and acts as a wonderful first impression for visitors to the cathedral,” added Martin. Arkoni has clearly hit the high notes on this particular project with modern aesthetic metalwork features combining perfectly with practical glazing systems.